Yorkshire Terrier January 5, 2019 April 12, 2019 No Comments on Are Yorkies Hypoallergenic? Yorkie is a small dog that carries huge love inside its heart. But the dog has many benefits other than its loving nature. One benefit of adopting this dog as a pet is that they are hypoallergenic. This means that they are best suitable for those people that are prone to allergies and reactions. 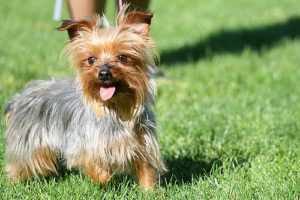 The Yorkshire terrier as among the 15 hypoallergenic dog breeds. Are Yorkshire terriers really hypoallergenic dogs? One thing we all need to know is, there is nothing 100% hypoallergenic. There is a misconception in Yorkies pet owners. They think that if they trim Yorkie hair regularly then the danger of allergies will be diminished. It’s not like that fellows! You can only minimize the risk with proper haircuts, trim, and regular washing. The possible allergens other than hair or fur includes Dander and Saliva. One of the possible reason your dog could cause allergy to people around is dander. It is just like dandruff in humans. Dander is the dead skin or extra skin that naturally sheds from the body of the dog. But in Yorkies, it is very diminutive so can be handled with proper techniques. Saliva is not a serious issue with Yorkshire terriers, you just need to teach it to avoid licking. First of all, take your Yorkie to the vet regularly after intervals to know about the appropriate vaccinations. An air filter in the home could also be a good option to avoid allergies. You should also be in contact with or doctor as well to get some good anti-allergic nasal spray. You will have minimal chance of getting allergy if you are already using one. Sofas, blankets, rugs get allergens hidden in their texture so try to clean those with the vacuum cleaner or it’s better to have solid flooring, leather sofas that could be easily cleaned.